Recently our bedroom got a simple refresh thanks to new paint and switching around some furniture. See the before and after pictures and get some ideas for your own small master bedroom here. Hi friends! My master bedroom refresh is finally 100% finished! I’m not sure why the simplest of makeovers seem to take just as long as the big ones. But it’s done now so that’s all that matters! 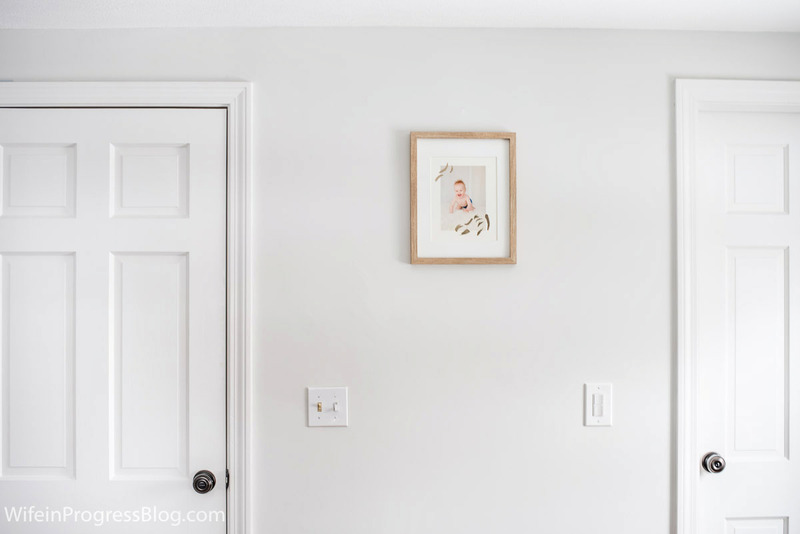 If you remember back to a few weeks ago, I shared how I had fallen in love with Benjamin Moore’s Paper White, a really soft dove gray paint color. One Saturday afternoon, I had the idea to repaint my master bedroom walls and the transformation was so dramatic. You know when that first wall is covered with paint and you just instantly know the color was meant to be? It’s such a great feeling! The idea for this bedroom was to create a serene space, while also making it feel considerably brighter. To achieve this, I stuck to a very neutral palette of pale gray and white with touches of taupe. Why taupe? I had picked up this pretty pillow from Target and loved how it played alongside the white and dove gray, so I knew it had to be the accent color in the room. Instead of adding color in to lift the space, I focused heavily on introducing a variety of textures to stop the room from feeling flat and cold. You can see all the different textures from the wood elements (bamboo blinds, wall hanging, picture frames) to the duvet cover, shag rug and even the curtains. The curtains are actually my favorite part of the room. I knew exactly what I wanted them to look like before I even found them. It took me a few weeks but finally HomeGoods had the winning pair. Of course, right? They have everything! Speaking of HomeGoods, this shelf is also a purchase from there. It’s actually from about 6 years ago and I dug it out of storage when I realized it would be perfect for this bedroom. BUT, I’ve seen them there a few times this past year so if you like it, keep an eye out for one! In terms of what’s on the bed, I don’t want to be taking a million things off the bed every night so I have intentionally kept it simple. There’s enough pillows to sit up and read (or watch TV) and then just pretty little gray that sits nicely at the end of the bed. In my previous post about this room, I told you that I took the chair from my son’s nursery and put it in here. That corner of the room really needed something since your eye goes there right on entering the room, and I think that chair is perfect. Unfortunately, the baby is still chairless but we will find him something soon! I’m also so happy with my new lamps. They are sleek and modern and the bright white textured base contrasts so nicely against the dark wood of the nightstand. I just saw you used Paper White, I love it! I love how serene your master looks, do you mind sharing the wall color please. Hi! The room looks gorgeous! Could you tell me what color/fabric you have on the Pottery Barn headboard and seems to match perfectly with the Wayfair bench. The paint color is so peaceful. I love all the texture, and I especially love the curtains !! The whole room just looks pretty perfect. Can you tell me where you got the bamboo blinds ? They are just the color that I have been looking for. Hi Kathy! The blinds are the Levolor “cut to size” variety that they sell at Lowe’s. The color is Tatami, I believe.